A new internet presence right in time for the company’s 50th anniversary. 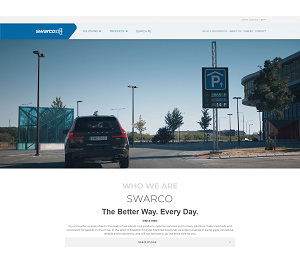 The greatest change, which is a consequence of the group’s brand strategy pushing for the umbrella brand SWARCO, is that there is now only one brand website under www.swarco.com and no more individual company websites. “There is a clear focus on our solution capabilities, however without neglecting the numerous internationally successful SWARCO products in the different market sectors”, adds Neumann. Apart from German and English, the website will be available in a dozen of languages in the near future. The new site has been developed taking into account a user-friendly content management system, a fresh graphic look and Search Engine Optimisation (SEO) aspects. A lot of progress has also been made in SWARCO’s Employer Branding activities, presenting the company as an attractive employer who is constantly looking for the best heads in the industry. The new internet presence went live at the beginning of February and comes right in time for SWARCO’s anniversary year. It was 50 years ago in May 1969 when Manfred Swarovski built his first factory in Austria, producing glass beads to make road markings retroreflective and laying the foundations for what is called SWARCO today. Over five decades the group has grown into a global leader in road safety and intelligent traffic management, present in 70 countries, employing 3800 people worldwide and generating revenues of almost 700 million Euros.